We believe a healthy attractive smile may be your most valuable facial feature. 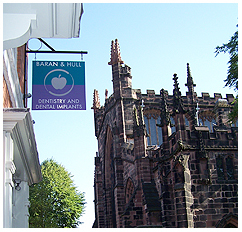 We are pleased to offer our patients a range of options for their dental care. Our aim is to provide a comprehensive range of quality innovative dental care for the whole family in a fun, relaxed and professional environment. We believe that dentistry delivered with care and consideration will improve not only your appearance and health, but your self-confidence and quality of life. We are committed to maintaining a safe and healthy environment and a pleasant experience for our patients. We continually monitor and improve our standards of service to patients. Written treatment plans are routinely provided for patients and referring clinicians will be kept informed. We endeavour to see all patients and have wheelchair access to all areas of the practice including fully disabled toilet facilities. There is a public car park within 30 metres of the practice. If you have any disability that you think we need to know about please give us a call before your appointment and we will do our best to put suitable arrangements in place to accommodate your needs. We also have the facility for Hearing Loop, NGT Lite telephone access and Large Print documentation (available on request).